Finding the best portable table saw when for most of you there is limited experience of these machines can best be decided from their relevant reviews. ie From tradesmen such as myself, who have vast experience of using them. 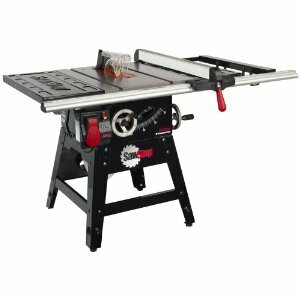 I used an Elu flip over saw for many years, it was a miter saw but when flipped over became a circular table saw and at the time I rated it well. It was heavy to carry but the weight helped its stability when cutting large pieces and plywood, so I would always choose weight as a plus factor. A trolley would have been handy but I had 2 strong apprentices to help me when needed. 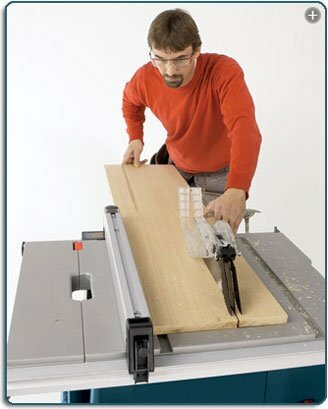 This type of table saw has been vastly improved by DeWalt and Makita who, along with Bosch, remain at the forefront of woodworking machinery manufacturers. N.B. I have only been able to find these two saws in the U.K. This flip over is now available in 110volt and 240volt, the 10" sawblade Dewalt DW743N 240V 250mm Combination Saw at £666.98 and the 8" blade MAKITA LF1000 260mm Flip Over Saw 110v at £668.34 which has been reduced by £19.00. Back to table saws and the Bosch and SawStop are reviewed very well and better than others, so I will focus on these two. The Bosch 4100 Series have gained most popularity points, rated highly by scores of contributors. I would always look for safety features to be part of the machines, particularly as I am a carpenter and strangely most accidents happen to tradesmen, rather than hobbyists. Probably because we become complacent with the machines and forget the dangers. 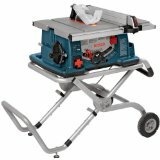 Staying with Bosch but reducing the price quite a bit to $399.00 is the Bosch GTS1031 10-in Portable Jobsite Table Saw , which at 52lbs can be carried quite easily and merits itself in the category of 'best portable'. The Sawstop CNS175-SFA30 1-3/4 HP Contractor Saw with 30-Inch Aluminum Extrusion Fence and Rail Kit is rated far and wide as being the best portable table saw for shared use, particularly on a construction site. It has an additional feature of a braking system which operates when skin (fingers/hand) wander too close to the blade. This sort of technology completely baffles me but I’m sure my beloved has the same sensor. Labelled as being the most precise saw on the market today it weighs a hefty 280lbs, due to its cast iron table, sturdy enough for the rigours of a building site, but I wouldn’t want to move it so often ! Its working measurements are 34.75" high x 58.5" wide and 40" deep, with a price of $ 1,749.00. No problem at all cutting sheets of plywood with a person doing feed-off at the rear. The Mobile Base at $160 would be a good investment to transport this machine, if like me you worked in your workshop and also on site.